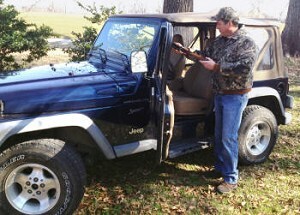 The Jeep Wrangler has always been one of America’s favorite hunting vehicles! Great Day just developed the perfect gun rack for the Wrangler—installs in seconds inside the front headliner—providing safe and protected transport. The QuickDraw holds two full-size guns (with or without scopes) in soft, foam-lined gun clips, held securely with handy Velcro straps. 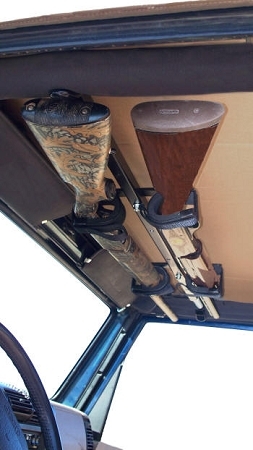 The QuickDraw Gun Rack expands out from 42 to 48 inches and locks in place to the Wrangler’s side roll bars with Great Day’s patented “opposing force” installation system. The QuickDraw is constructed of aircraft aluminum, finished in black powder-coat enamel and weighs only 9 lbs. Ships by UPS.